Print Out This Guide, The Use of Electronic Test Equipment for Outboard Motors. The purpose of this brochure is to give the marine technician a general overview or the types of test equipment and their use.� The most common, easy to use, test equipment will be covered. Due to the rapid development of computerized EFI (Electronic Fuel Injection) and ECU Ignition systems, more complicated and expensive test equipment will be developed for the marine industry, just as it has been developed for the automotive industry. Some newer equipment will include the use of scope meters (such as the Fluke 98), ECU and EFI testers, digital analyzers, and computer interface testers. Hopefully, the newer test equipment will be user friendly and many Troubleshooting problems will be diagnosed with less complicated equipment. The test procedures at the end of this brochure are intended to give the technician a better understanding of the most common failures and allow testing with minimal equipment. A. Analog meter - The analog VOM is a dial/needle movement with multiple switch settings and ranges on each setting. This meter usually requires "calibrating" of the scale before use. ���� They normally consume batteries at a fast rate. ������ 1. Manual range setting - The measurement range is selected by a switch, i.e. 20 ohm, 200 ohm, 2k ohm, 200k ohm and 20M ohm.� The symbol for ohms is W.
������ 3. Manual / Autoranging - Some meters have both manual and automatic settings, i.e.,�the Fluke 88, Fluke 29, etc. ������ 4. Ranges - As a reminder, when referring to electronics, the k is 1000, i.e., 1k ohm is 1000 ohms and 20k ohms is 20,000 ohms.� The M is 1,000,000 i.e., 2M ohm is� 2,000,000 ohms. ������ A. DVA (Peak Reading) Voltmeters - Specialty meters for measuring average DC voltages and AC voltage spikes on Ignition systems. Some of the more common meters include the Stevens CD-77, Merc-o-tronic and ESI meters with DVA ranges. ������ B. Multi-use Voltmeters with DVA Adapters - Analog or digital VOM (volt, ohm meters) using a plug-in DVA adapter to measure DVA voltages. Accuracy varies quite a bit between manufacturers and types of meters when taking DVA readings. The CDI/Rapair 511-9773 peak adapter is highly recommended for use with all�Fluke meters. This type measurement is made by clamping an inductive pickup probe on one of the spark plug wires. Very few of the inductive systems will work well on two cycle CD ignitions due to the RF and microwave noise being generated. The Fluke 88 Multimeter used with the CDI/Rapair 511-9788B two cycle adapter, is highly recommended.� The� Merc-o-Tronic Inductive Tach and the CDI/Rapair� Tach Adapter (P/N 511-9785) are some of the units recommended for both two and four cycle service.� Inductive tachometers can be a real time-saver when trying to find a high speed miss by comparing the readings on all cylinders, i.e., if one or two cylinders shows a big difference in comparison to the other cylinders. The use of inductive tachometers is recommended for detection of double firing cylinders. If one cylinder shows twice the RPM of the other cylinders, it is probably double firing. ����� B. Reflective Tach Measurements - These are optical tachometers, that use a piece of reflective tape on the flywheel or pulley. ����� C. Contact Tachometer - NOT RECOMMENDED for Outboard Use. Uses a center hub rotator and counts the RPM..
����� D. Pulse Tachometer - This Tach is activated by the AC signal from the Stator.� The RPM signal is related to the number of Pulses received from the Stator. This is probably one of the most useful systems. The Fluke 51 and 52 temperature meters, or the accessory temperature attachments for the Fluke meters, are capable of measuring exhaust gas temperature, water temperature, head and block temperature. Various probes are available for different types of measurement with the bead probe being one of the most useful. The bead probe can be positioned on the block with the use of duct tape. They can be used to measure temperature at various points on the engine or water temperature without contact. However, some running engines generate too much electronic static and will interfere with the infrared sensor readings.� Holding the temperature probe too close may cause the Ignition noise to ruin the Unit. These can be used for quick measurementof over heating conditions. Most battery CD Ignition modules are sensitive to low battery voltage and battery reversal. During cranking, a DC voltage level at the pack of less than 9 !/2 Volts is unacceptable and indicates a problem in the Harness, keyswitch, starter or battery. WOT voltages above 16 volts will blow most battery ignitions. Problem is likely to be either the battery or cables. This is a good way to check the regulator/rectifier battery charging operation in the charging system. The 10 amp charging system can be checked with a good VOM that has up to 10 amp capability (Fluke 29,73,88, etc.). The red Wire is disconnected from the rectifier, the one meter probe is placed on the connection, and the other is placed on the red Wire. Warning! Make sure you do not exceed 10 amps or touch ground with one probe. This could damage the meter. The 35 amp charging system requires an inductive pick up or a high current amp adapter, such as CD/Rapair's 511-9772 (1-400 amp). Remember, on outboard charging systems at idle speed the current is @ 1/5 of the current rated. This is used to test battery CD modules on the engine by replacing the points or triggering device electronically. The CDI 511-9701 Battery CD Tester is highly recommended due to its ability to fire the Ignition systems up to 3000 RPM without the engine running. It can be used to test the CD module, distributor cap, Ignition coil and plug wires. Additionally, the tester can be used to test Mercury Outboard EFI injectors. Electronic fuel injection testers are available for use with the specific type of EFI system it was designed for. Use of these testers are not covered in this brochure. A break through by CDI/RAPAIR (511-9710) allows you to test most Mercury Outboard, Mariner, Force Outboard Motor, Chrysler triggers and OMC's Quick Start timer bases on the engine. The Unit can be used to test points, preamp triggers, Mercury Outboard battery CD triggers, hall effect triggers, Alternator driven Ignition triggers, and can be used to check injection Pulse from Mercury Outboard EFI modules. Intermittent Firing: This problem can be very hard to isolate. A good inductive tachometer (fluke 88 is recommended) can be used to compare RPM on all cylinders up through wide open throttle. A big difference on one or two cylinders indicates a problem. Two or more cylinders misfiring: It is recommended that both power packs be replaced, unless the problem is a bad Trigger. Visually check the Stator, Trigger and flywheel: Cracks, burned marks and bubbling on the Stator or Trigger indicate a severe problem. If the Stator shows bubbling around the battery charge windings, more than likely you will have to replace the rectifier/regulator in addition to the Stator. Signs of rubbing on the flywheel usually indicate a bad upper or lower Bearing. Check both the outer Trigger magnets for signs of cracking and to be sure that they are not loose. Open type timer bases: When all cylinders fire with the spark plugs out, but one or more cylinders quit when the spark plugs are reinstalled, regapping the timer base may solve this problem.� Please refer to the Troubleshooting guide for OMC power packs and CD's item #8. Quick Start timer bases:� These timer bases cannot be checked like the other timer bases. Please refer to the Troubleshooting guide for OMC power packs and CD,s item #5. Engines with SLOW features: If the complaint is that the engine will not slow down after a few minutes and starts shaking real bad, (but the engine is NOT overheated) try replacing the temperature switch (the one with the white/black and tan wires coming out). Check routing of tan wires. Relocate as far from the spark plug wires as possible. Check blocking diode in engine Harness. No fire on the 1,3,5 or 2,4,6: Swap red and red/white wires, also blue with blue/white wires. If the problem moves to the other set of cylinders, the Stator is at fault. Disconnect rectifier and retest. If the engine fires normally, replace the rectifier. If no change, we recommend replacement of the Stator. If you replace the Stator and the problem remains try another flywheel, if possible. No fire on one cylinder: Since this condition can be caused by the opposite switch box (pack), disconnect the white/black jumper between the packs and retest. If the dead cylinder starts firing, replace the pack that was firing all three cylinders. As a verification, swap the Trigger and spark plug Wire to the cylinder closest to the dead cylinder, (i.e., if #1 is dead, swap the brown Trigger Wire with the white one). If the problem moves to #3, replace the opposite power pack (switch box). If #1 is still dead, swap the green and green/white coil wires. If the problem moves to #3, replace the power pack (switch box). Please remember to put the Trigger wires in the correct order after you finish. for more detailed information, please refer to the Troubleshooting guides on the other pages. CAUTIon; DO NOT Use A MAINTENANCE FREE Battery with these TypeS of ignitions As theY TEND To OVERCHARGE and BLOW the Packs.> Typically 17 Volts +. Note: A large portion of the problems with the battery CD units are caused by low battery voltage or bad ground connections or high battery voltage. Low Voltage symptoms are weak erratic firing of cylinders. Misfiring after a few minutes of running can be caused by excessive (Over 15.5 Volts DC) voltage at the pack - See #2 below. 1) Check all battery and ground connections. 2) Check the Voltage on the red (or purple) Wire at the CD Unit. If the voltage is less than 9 1/2 volts during the cranking there is a problem in the battery circuit. These units require at least 9 1/2 volts to fire properly. Connect a jumper Wire directly from the battery (+) terminal to the red (or purple) Wire. Retest. ATTENTIon: In order to kill the engine if it cranks, the jumper Wire must be disconnected and/or choke the engine. If the engine still fails to crank, recheck voltage as above. If low, replace the battery and retry. Warning: Check he voltage on the red (or purple) Wire at the CD Unit through the RPM range. At no time should the voltage exceed 15.5 Volts DC. 3) Disconnect points and/or sensor Wire and connect a battery tester. Hook up the Battery CD Tester according to the operators manual and align rotor with spark plug Wire. Connect a spark gap to all spark plug wires and turn the Ignition switch on. If the CD Unit fires only to one spark plug Wire, check the points, sensor, anti-reverse spring and wires for breaks and shorts. If ANY other spark plug Wire fires besides the one the rotor is aligned with, the distributor cap and rotor should be replaced. The Battery CD tester will fire the system to approximately 3000 RPM. If the Battery CD tester (511-9701) is not used, strike points Wire against engine ground. for the sensor, strike the two wires together. The CD Unit should fire every time. If the CD Unit fails to fire, it is usually bad. Disconnect points Wire and check voltage on the points Wire. You should read close to battery voltage with the key switch on. No voltage means a bad pack. If OK, reconnect the points Wire. Using the piercing probes (511-9770) connect the DC volt meter to the points Wire. Turn the switch on and slowly rotate the flywheel. You should see the voltage fluctuate up and down. 5) Check the Ignition coil. An open, cracked or poorly grounded coil can burn out a battery CD Unit. 6) Check the DVA voltage on the primary input Wire to the coil. Reading should be approximately 200 volts or more. NOTICE: Initial DVA readings should be taken with everything hooked up. 1) Check the flywheel for cracked and lose magnets. 2) Disconnect the kill Wire(s) from the pack and retest. Connect a DC voltmeter between the kill wires and engine ground. Turn the Ignition switch on and off several times. If at any time, you se DC voltage appearing on the meter, there is a problem in the battery Harness or the Ignition switch. NOTE: At no time should you see battery voltage on any kill wires. If found, replace the Stator, Burnt marks of discolored areas on the battery charge windings indicates a possible problem with the rectifier. Disconnect the kill Wire AT the Pack. Check for bare or broken wires on the Unit, Stator and timer base. Measure DVA voltage of the Stator with everything connected. Readings should be approximately 150 volts or more. On Standard CD types, check DVA voltage on the timer base white Wire. Voltage should be approximately 150 volts or more (Quick Start units usually have the white Wire tied to ground inside the pack). If the reading is good on the Stator but low on the white Wire, the timer base is usually bad. Disconnect the rectifier. If the engine fires, replace the rectifier. Disconnect the timer base. Using the Fluke meter, set to ohms scale, and one of the piercing probes, connect the red lead from the meter to the white Wire in the Amphenol connector from the timer base. Use the black lead from the meter and check to all of the pastel colored wires in both connectors from the timer base. all of the readings should be fairly even, normally between 1 and 2 meg ohms measured with a Fluke meter. with the red lead still connected to the white Wire, connect the black meter lead to the black/white Wire in the opposite connector from the timer base. You should read approximately 220 ohms. If one or more cylinders are out of line, (I.E. all the rest are reading 1.2 -1.8 meg ohms and one reads 0.898 or 2.2 meg ohms) the timer base is usually bad. If the engine misses on one cylinder with the white/black temperature Wire hooked up and does not with it unhooked, this is usually the timer base causing the problem. If one or more cylinders will not fire with the spark plug installed], check the timer base resistance between sensor leads: PP2, from white/black to black/white; PP3 from black/white to all all whit/blacks; PP4 1-3 and 2-4, readings should be 10-20 ohms for all sensor coils. (some of the older units with the metal cased CD's read 8-14 ohms). Regapping may solve the problem. CDI Gap Gauge 553-9702 is recommended for PP3 and PP4. To regap, remove the epoxy covering and loosen the small nuts on the center bolts going thru the heat shield. Loosen the anchor screws holding down the sensors. Slide the sensor in toward the Crankshaft until it touches the gap gauge. (553-9702) or the metal stop at the bottom of the sensor. Paint the face of the sensor or the Trigger magnet on the flywheel, with a contact detector, and reinstall the flywheel. Crank the engine over several times and remove the flywheel, checking to see if the Trigger magnet is striking the sensor face. Remove the black/yellow kill Wire from the rubber connector to see if the pin is broken. Check the kill circuit in the pack by using a jumper Wire connected to the black/yellow Wire coming out of the pack and shorting it to ground. If this kills the engine, the kill circuit in the Harness or the boat is bad, or the Ignition switch is bad. Check for dragging starter or low battery causing slow cranking speed. DVA test the timer base. DVA check Stator voltage to both sides. The readings should be fairly equal. If it exceeds 400 volts, replace the pack on the bank. If unequal, swap banks with the Stator leads and see if the problem moves with the Stator leads. If it does, replace the Stator. Disconnect one of the black/yellow kill wires, AT the Pack. If the problem goes away, replace the pack that was running smooth as is probably has a bAdBlocking diode. CAUTIon; DO NOT Use A MAINTENANCE FREE Battery with these TypeS of ignitions As theY TEND To OVERCHARGE and BLOW the Packs. Typically 17 Volts +. Note: A large portion of the problems with the battery CD units are caused by low battery voltage or bad ground connections or high battery voltage.� Low Voltage symptoms are weak erratic firing of cylinders. Misfiring after a few minutes of running can be caused by excessive (Over 15.5 Volts DC) voltage at the pack. - Warning : Check the voltage on the red (or purple) Wire at the CD Unit through the RPM range. At no time should the voltage exceed 15.5 Volts DC. Warning!! Battery REVERSAL WILL USUALLY DESTROY Battery CDs and TRIGGERS. Disconnect the Mercury Outboard switch and reset, if the engine fires, replace the Mercury Outboard switch. Check the voltage on the red and white Ignition wires at the CD Unit. If the voltage is less than 9 1/2 volts during cranking there is a problem in the battery s or the Ignition switch box. These units require at least 9 1/2 volts to fire properly. On a 332-2986 switch box, check the voltage on the brown terminal (white/black for 332-47960 where the Trigger is hooked up. It requires at least 9V at cranking.� DVA check between the white and black wires (black and blue on 332-4796). You should read at least 2 1/2 volts at cranking. Connect a jumper Wire directly from the battery POS (+) terminal to the red and white Ignition wires (the red Wire is not needed for the CDI units). CAUTIon: DO NOT Connect the JUMper Wire To the WHITE Trigger Terminal.� Retest: � ATTENTIon: in order to kill the engine if it cranks, the jumper Wire has to be disconnected and/or choke the engine. If the engine still fails to crank, recheck voltage as above. If low, replace the battery and retry. If there is still no fire, disconnect points Wire (or Trigger wires) and connect the Battery CD tester (511-9701), according to the instructions in the manual, and align the rotor with a spark plug Wire. 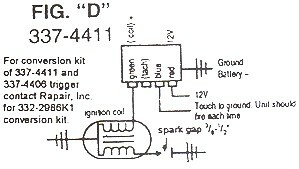 Connect a spark gap tester (511-9766) to all spark plug wires and turn the Ignition switch on. If the CD Unit fires to only one spark plug Wire, check points Wire (for breaks or shorts) or Trigger. If ANY other spark plug fires besides the one the rotor is aligned with, the distributor cap and rotor should be replaced. The Battery CD tester will fire the system to approximately 3000 RPM. 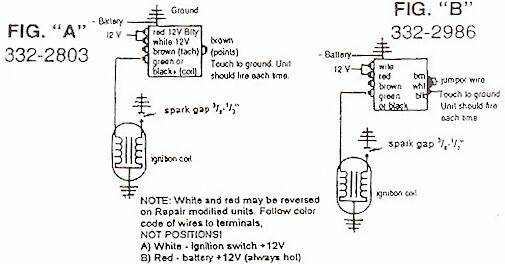 If the Battery CD tester is not used, see related drawings on the Schematic page (following). If the CD Unit fails to fire with this hookup, it is usually bad. Following the instructions included with the Trigger Tester (511-9710) check the Trigger to see if it is good or bad. This problem usually indicates a bad Trigger. 4) Check the Ignition coil. An open, cracked or poorly grounded coil can burn out a battery CD. 5) Check the DVA voltage on the primary input Wire to the coil. Using the fluke meter with the peak reading voltage adapter (5111-9773), or CD 77. The reading should be approximately 100 volts or more for OEM CD's, and 200+ for CDI electronics units. If the engine speeds up when you remove one spark plug Wire, the internal exhaust plate is more than likely warped. The following tests can be performed on the bench or on the engine.� NOTE: Disconnect the Trigger mechanism prior to testing. Connect a DC volt meter between the kill wires and engine ground. Turn the Ignition switch in and off several times. If, at any time, you see DC voltage on the kill wires, there is a problem with the Harness of Ignition switch. Battery voltage on the kill circuit will destroy most CD units. If found, replace the Stator. Burned marks or discolored areas on the battery charge windings indicate a possible problem with the rectifier. Disconnect kill Wire AT the Pack. Check for broken or bare wires on the Unit, Stator and Trigger. Check the DVA voltage of the Stator, (on 3 and 6 cylinder models read from each red and blue Wire to engine ground; on 4 cylinder models read between the two red wires and between the two blue wires), with everything connected. The readings should be approximately 180 volts or more on the blue wires. and 30 or more volts on the red wires. Disconnect the rectifier. If the engine fires replace the rectifier. Check the kill circuit in the pack by using a jumper Wire connected to the black/yellow terminal or Wire coming out of the pack and shorting to ground. If this kills the engine, the kill circuit in the Harness or on the boat is bad, possibly the Ignition switch. Disconnect the rectifier and retest. If the miss is gone, the rectifier is usually at fault. If the miss still exists, check the DVA voltage (between the red wires on 4 cylinder, or red wires to engine ground on 3 &6 cylinder) of the Stator at high speed. NOTICE: Use caution when doing this and do not exceed the rated voltage range of your meter. The readings should show a smooth climb in voltage. If there is a sudden or fast drop in voltage right before the miss becomes apparent, the Stator is usually at fault. If there is no indication of the problem, it could be a small water leak in one or two cylinders. Check for dragging starter or low battery causing slow cranking speed. DVA test Stator and Trigger. Disconnect rectifier, regulator and retest. If the problem goes away, replace the rectifier and/or regulator. Check DVA voltage of the Stator between blue wires and to ground. Readings to ground should be fairly equal. If unequal, swap Stator leads (blue with blue/white, red with red/white) and see if the problem moves with the Stator leads. If it does, replace the Stator. Check Trigger resistance between #1 & #2, compare to resistance between #3 & #4. The readings should be approximately 850 to 1250 ohms for OEM (950 ohms for CDI). for test purposes only, swap the Trigger leads 1 &3, and 2 &4. If the problem moves, replace the Trigger. If it does not move, swap coil primary wires, and replace the pack if the problem remains on the same cylinder. Check the DVA voltage of the Stator, checking from each red Wire to engine ground. The readings should be approximately 180 volts or more on the blue wires and 30 or more on the red wires. if a DVA meter is not available, swap both sets of the Stator wires between the packs. If the problem moves, replace the Stator. If the problem stays on the same bank, swap physical location and all connections of the two packs. If the problem stays with one pack, replace the pack. NOTE: If the pack is bad, it is recommended that BOTH packs be replaced if the packs are not manufactured by CDI or Rapair. If the packs lose ground, internally or externally, the packs manufactured by other sources usually have severe damage to the bias circuit and need to be replaced as a set. The packs manufactured by CDI will withstand loss of ground connection, normally with no damage to the bias circuitry. In most cases you will just lose fire. Disconnect the white/black Wire between the packs on a 6 cylinder and retest. If all cylinders now fire, replace both packs as there is a problem in the bias circuitry. On all others, check for low voltage from the Stator and Trigger. Disconnect the rectifier and retest. If the problem disappears, replace the rectifier. On 3 and 6 cylinder engines, disconnect white/black Wire and check the bias circuit (white/black terminals) resistance to engine ground. Readings should be approximately 15,000 Ohms for Standard packs and 9,600 Ohms for racing units. If the readings are correct on the packs, index the flywheel and check the timing on all individual cylinders. If the timing varies, replace the pack. On 4 cylinder engines the bias circuit is internal, therefore the only way to verify proper operation of the bias circuit is to index the flywheel and check the timing on each cylinder. If the timing is off, replace the packs. 2) Check the voltage on the blue Wire at the CD Unit. If the voltage is less that 9 1/2 volts,during cranking there is a problem in the battery circuit. Theses units require at least 9 1/2 volts to fire properly. Connect a jumper Wire directly from the battery (+) terminal to the blue Wire on the CD and retest. ATTENTIon: In order to kill the engine if it cranks, the jumper Wire must be disconnected and/or choke the engine. If the engine still fails to crank, recheck voltage as above. If low, replace and retest. Disconnect points/sensor Wire and connect the Battery CD tester (CDI #511-1701) according to the instructions on the back of the tester, and align distributor rotor with a spark plug Wire. Connect a spark gap tester (CDI #511-9766 is ideal) to all spark plug wires and turn the Ignition switch on. If the CD Unit fires to only one spark plug Wire, check the points/sensor (white/black) Wire for internal breaks. If ANY spark plug Wire fires besides the one the rotor is aligned with, the distributor cap and rotor should be replaced. The Battery CD tester will fire the system to approximately 3000 RPM. If the Battery CD tester is not used, strike the points/sensor Wire against engine ground. The CD Unit should fire every time. If the CD Unit fails to fire, check the Ignition coil (open, cracked or poorly grounded coil can burn out a battery CD). Connect the spark gap tester (CDI #511-9766) directly to the Ignition coil. If it doesn't fire, replace the coil with any known good CD coil. If the Unit still fails to fire, it is usually bad. 4) Check the DVA voltage on the gray Wire primary input Wire to the coil. Check the DVA voltage on the gray Wire primary input Wire to the coil using the Fluke meter with the peak reading adapter (CDI #511-9773), or CD 77, and the piercing probe (CDI #511-9770). Reading should be approximately 200 volts or more while connected to the coil. 1) Disconnect the white and blue kill wires from the CD. 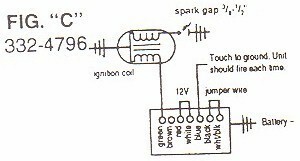 2) Connect a spark gap tester to all Ignition coils and test with the spark plugs in and out. If the coils fire only with the plugs out, check compression with all spark plugs removed. A blown gasket on these engines can cause a no fire problem if the plugs are installed. NOTE: This is an unexplainable situation, but experience has shown it can occur. 3) Check the DVA voltage on the T1 and T4 terminals. Check the DVA voltage on the T1 and T4 terminals using the Fluke meter with the peak reading adapter (CDI #511-9773), or CD 77, by cranking the engine over and stopping to read the voltage. You should read between 170-270 volts. 5) Check to see if the Ignition coils are wired properly. On a 2 cylinder engine #1 is connected as NEGATIVE ground and #2 is POSITIVE ground. with a 4 cylinder, #1 & #2 are NEGATIVE ground and #3 & #4 are POSITIVE ground. A Reliable Volt/Ohm Meter (if the CD-77 is used for the DVA). 1. Check for broken wires and terminals, especially inside the plastic plug-in connectors. We recommend that you remove the pins from the connectors using the CDI 554-9706 Pin Removal Tool and visually inspect them. 2. Check the flywheel for broken or loose magnets. 3. Disconnect the kill wires from the CD and connect a DC voltmeter between the kill wires and engine ground, turn the Ignition switch on and off several times. If, at any time, you see voltage appearing on the meter, there is a problem in the Harness or Ignition switch. At No TIME SHOULD YOU See Battery Voltage on A Kill CIRCUIT. 4. Visually inspect Stator for burned or discolored areas. If found, replace the Stator. If the areas are on the battery charge windings, this indicates a possible problem with the rectifier. 5. Trigger Wire sets read approximately 50 ohms between the Wire sets(DVA-5V or more), OEM Stator reads 680-900 ohms CDI=250-300 ohms (DVA 180v or more) from blue to yellow. Neither Trigger or Stator should show any resistance reading to ground.. Disconnect kill Wire AT the Pack. Check for broken or bare wires on the Unit, Stator or Trigger. Using the Fluke meter with the CDI 511-9773 Peak Reading Adapter, or CD-77 and CDI 511-9770 piercing probes, measure DVA voltage of the Stator between the output Wire sets. with everything connected, reading should be approximately 180 volts or more. Resistance readings between the Stator Wire sets is (OEM 980-900 ohms/CDI=250-300 ohms). Disconnect the rectifier. If the engine fires, replace the rectifier. Check Stator and Trigger resistance. If readings are good, disconnect kill Wire from all packs. If the dead cylinder starts firing, the problem is likely the blocking diode in one of the other packs. If the two cylinders from the same CD Unit will not fire, the problem is usually in the Stator. Test per above. Check kill circuit in the pack by using a jumper Wire connected to the kill Wire coming out of the pack and shorting it to the ground. If this kills the pack, the kill circuit in the Harness or on the boat is bad, possibly the Ignition switch. Check for dragging starter or low battery causing slow cranking speed. DVA test Stator and Trigger. Using fluke meter with the CDI 511-9773 peak reading adapter, (or CD-77) and CDI 511-9770 piercing probes, DVA check Stator voltage to each pack at high speed. If it exceeds 400 volts, replace the pack. If the voltage drops below 200V, the Stator is likely bad. Disconnect the rectifier and retest. If the miss is gone replace the rectifier. NOTE: This Engine uses a battery powered inverter module to supply the high voltage for the switch box. The Inverter is in a 332-4797 switch box case. The Unit is easily identifiable by the fact of it only having 4 terminals instead of the usual 7. The Stator is for battery charging only. 1. Check the red Wire from the battery. You should have at least 9.5 volts while cranking the engine. 2.Check DVA voltage on the purple/white terminal. 0.2 volts or more is needed to Trigger the inverter box. If low or no voltage at all- Check the Trigger from the white/black to the yellow, black, brown, white and purple Trigger wires. You should have at least 4 volts on each. In the event you have Trigger voltage but no voltage on the purple/white, the switch box is likely bad. 3.Check the DVA voltage on the blue terminal of the inverter module. Should be approximately 200-300 volts at cranking. Check the Trigger from the white/black to the yellow, black, brown, white and purple Trigger wires. You should have at least 4 volts on each. Disconnect white/black Wire and check the bias circuit (white/black terminals) resistance to engine ground. Readings should be approximately 8400W. If the readings are correct on the pack, index the flywheel and check timing on all individual cylinders. If the timing varies, replace the pack. NOTICE: The color codes listed above may appear on the packs, stators or triggers. Some packs have solid colors and some triggers have striped wires. Some of the newer items with striped wires may have an additional black stripe. NOTICE: The resistance readings given are for a room temperature of 68 degrees Fahrenheit. Higher temperatures will cause a slightly higher resistance reading. DVA readings should always be taken with everything hooked up. The CDI peak reading voltage adapter is specifically designed to work with FLUKE AUTO Digital VOLTMETERS. This adapter will simplify the testing of electronic Ignition systems, stators, and sensors. The peak voltage readings will be approximately the same as any other peak voltage meter, and the specifications in the test manuals can be followed without any major problems. STEVENS INSTRUMENT accessories for the CD-77 peak reading volt meter, SA5, SA6 (CDI#511-9756) and PL88 (CDI#511-9775), along with the CDI 511-9770 piercing probes are highly recommended for use with this adapter. OHMS RANGE OHMS RANGE OHMS Coil DVA Coil MIN. DVA MIN. DVA MIN. 1. These timer bases are hard to test. Please refer to the OMC Troubleshooting Section. 2. Optical triggers cannot be tested by an ohmmeter. 3. The pack has a black sleeve on the Trigger Harness. You may use either the black or gray sleeved stators. 4. If the pack has either a blue or gray sleeve on the Trigger Harness, you must use the gray sleeved Stator. A. Most OMC ignitions charge coils are tested from brown to brown/yellow or brown/white Wire on Stator. See the detailed test specs for specific information. B. all voltage tests on the Ignition to the coil should be done with the CDI 511-9775 load resistor to ground. blue/white stripe for the low speed change coil. 2. 3 & 6 Cylinder. 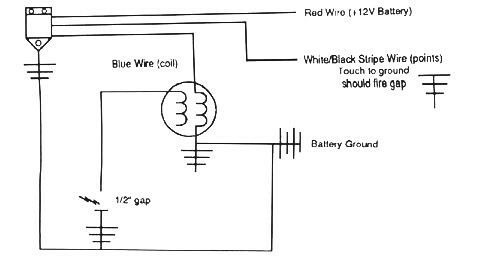 '76-up charge coils are measured from ground (black Wire if present) to red and blue wires. 9. 2 Cylinder. triggers read between the two Trigger wires. 10.2 Cylinder. '77-up with 339-7452 switch box, check from black/white and black/yellow to ground. Disconnect the extra black/yellow Wire going to the Harness (kill Wire) before testing. 11. all RED Stators WILL READ APPROXIMATELY 600-700 OHMS BETWEEN the WHITE/GREEN and the GREEN/WHITE Wires, (DVA 180V +) Mercury Outboard Red stators do not have a low/high speed winding. * Mercury Outboard replaces this Stator with the Red Stator Kit. (a) Blue to blue/white may read 600 W for some CDI stators. (s) Check DVA and resistance readings between the Wire PAIRS for each cylinder. Each cylinder has two wires from the Trigger. (t) Check DVA and resistance readings between the blue and yellow Stator wires (some unites may have brown wires with blue and yellow stripes). (u) Check DVA and resistance readings between the two Stator wires (some units have two blue wires instead of a blue and a yellow). (v) Test from the white/black stripe to all of the other Trigger wires. (w) Measure between the two Trigger wires. (x)Check between the #1 and #2 cylinder Trigger Wire set, and between the #3 and #4 cylinder Wire set. (z) Read from the blue to blue/white and red to red/white. (aa) Check from blue to ground and blue to yellow. (bb) Red stators approx. 600-700W between white/green & green/white wires (DVA 180+). Red stators do not have low/high speed windings. (cc) Measure from the black to the blue and red wires.